In sports, everyone is a winner-some people just win better than others. Like various DC-area media members, who took a shot at completing the Redskins' conditioning test that the disgruntled Haynesworth has been unable to pass. It's 25-yard shuttles, for 300 yards, then a 3½ minute break, before doing it all over again. Mike Shanahan called it a "very minimal test," and that "most people could do this test in their sleep." Has Haynesworth tried it asleep yet? His first try, on Friday, he took an extended bathroom break between the two parts, and was disqualified. His second try, later that day, he failed to complete the first half in the allotted time, so didn't bother with the rest. Because of a sore knee, he has begged off the test for three days straight. But that doesn't mean journalists, usually the most out of shape group of people you'll ever see, couldn't give it a whirl. And whirl they did. WTOP's Andrew Mollenbeck was caught by surprise with the challenge, having just eaten breakfast. He only ran 150 yards for the first leg of the test, so we can throw his results out the window. But he still did his second leg faster than Haynesworth. But the most telling has to be The Atlantic's James Fallows, who says he "barely passed it," but he did still pass. Fallows is 61 years old. What does this tell us? Not much. 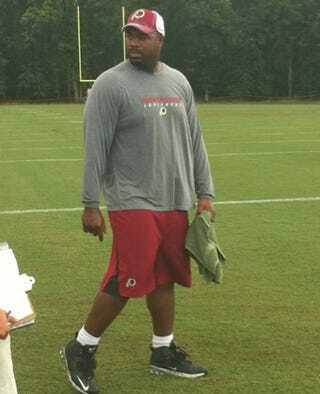 None of those journalists are carrying lineman weight, even with Haynesworth's new trim figure. But that's not a satisfying storyline. No, we prefer the one where the player with the biggest guaranteed contract in NFL history, who didn't want to play in a 3-4, isn't any better at sports than a woman, and isn't as good as an old man.